"I was shocked when the Adventist World Radio director asked me to start coming to the studio,” Hla Yee says. She was working as a housekeeper in the Upper Myanmar Mission office and had only a fourth-grade education. What could the director possibly have in mind? she wondered. Yee is one of the very few Adventist church members from the Shan ethnic group in Myanmar. Her life began in a small village named Pyin Gyi, located 30 miles from Mandalay. Like the rest of the people in the village, her parents and six siblings were traditional Buddhists. Yee received her primary education at the monastic school in the village. Studies were offered only for four levels, however, so when her parents couldn’t send her for further schooling in another town, she started working with them on their farm. Then one day, a man named Tun Bo came to Pyin Gyi. He worked for a timber company, and soon the entire village took notice of his industrious style. Bo was a Seventh-day Adventist who had previously worked as a Global Mission pioneer. * During his service, he was able to plant a church in a town called Kywenadauk, not far from Yee’s village. Today, that congregation has more than 100 members. In Pyin Gyi, Bo spent time getting to know many people, and he frequently talked about Jesus. Although the villagers liked his hard work, they disapproved of his religion. Their minds were made up that all Shan people were Buddhist, and they were not about to change their beliefs. As it turns out, Yee had noticed more than Bo’s work style: she also appreciated his personality. Luckily, her feelings were returned, and they fell in love. “But,” she recalls, “he would talk to me more about Jesus’ love than about his own love for me. I was interested in both the message and the man!” Still, it took her five years to accept Jesus. When Yee and Bo married, Yee’s parents refused to associate with her. She faced criticism from her relatives and friends and disapproval from the villagers. Before long, two of her grandparents died. To add to her pain, many people believed that Yee’s grandparents were affected by her marriage to a Christian. Sadly, more sorrow awaited her. When Yee became pregnant, she and Bo eagerly looked forward to starting a family of their own. But their baby was born prematurely and did not survive. As a young widow with two daughters and few job skills, Yee was grateful when the mission office offered her a job as a housekeeper. She didn’t think about the future much—until she received the call from Thang Pau, the AWR studio director in Pyin Oo Lwin. Church leaders had wanted to start producing programs in the Shan language for some time and were looking to recruit a program speaker who had technical, language, and theological skills. But they were unable to find anyone suitable. Then God led them to Hla Yee. She says, “When Thang Pau asked me to start working in AWR, I was surprised and really touched in my heart to accept.” She began taking computer classes and concentrated fiercely for six months to learn word processing and other applications. Although she was scared in the beginning, she picked up the skills remarkably quickly and amazed the church leaders with her rapid progress. Yee was given a laptop computer on which she now records, edits, and mixes programs on her own. 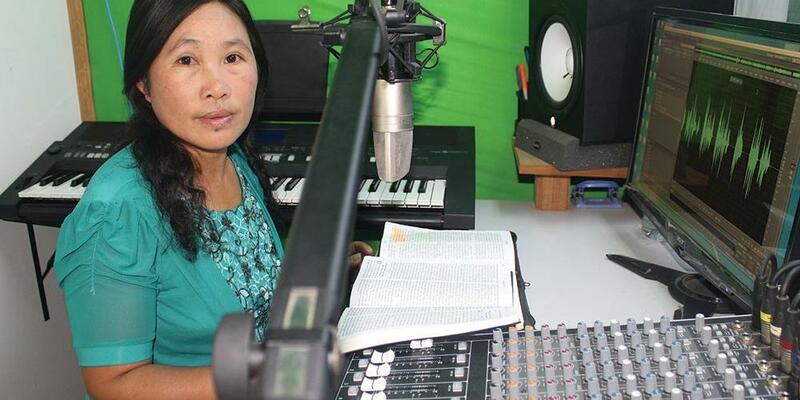 She translates scripts from Burmese into Shan and records children’s stories, health segments, Bible readings, Ellen White books, sermons, and more. These half-hour programs are broadcast seven days a week. Bible correspondence lessons are offered, but they are only available in Burmese. * A Global Mission pioneer is a church planter who works in an area or among a people group where there is little or no Adventist presence. For more information, please see page 7. Special thanks to Maung Maung Myo Chan, communication and public affairs director, Myanmar Union Mission.